Barcelona warmed up for the new season by lifting the European Super Cup as Pedro's extra-time goal earned them a 1-0 victory over Shakhtar Donetsk. The substitute played a one-two with Lionel Messi and slotted home five minutes before the end of the game. It was an uninspiring contest on a pitch that cut up badly at the Stade Louis II in Monaco and both teams struggled to create opportunities. Julius Aghahowa forced Victor Valdes to save, but Shakhtar rarely threatened. Barca, who became the first team to win the treble of Champions League, La Liga and Spanish Cup last season, open their league campaign on Monday against Sporting Gijon. They fielded summer signing Zlatan Ibrahimovic up front, but the £60m Swedish striker had a quiet start to his Barca career in a disjointed match on a poor pitch in the principality. The Catalans - missing the injured Andres Iniesta - struggled to find their rhythm as passes uncharacteristically went astray on a regular basis. Uefa Cup winners Shakhtar were content to contain and offered little in the way of an attacking threat, with striker Luiz Adriano starved of possession. Barca thought they should have had a penalty just before the break when Messi's free-kick appeared to strike an arm, but referee Frank De Bleeckere waved away their appeals. It was much the same story after the interval as chances failed to materialise, Ibrahimovic in particular toiling as he began the lengthy process of trying to justify his lofty price tag. Messi went on a couple of jinking runs at the heart of the Ukraine side's defence, but even the Argentine wizard was being frustrated in his attempts to open the game up. Ibrahimovic shot wide from 20 yards when he should have teed up Thierry Henry, and the Swede's miserable night was compounded when his penalty appeals were turned down shortly before being he was taken off by coach Pep Guardiola. With time running out Henry missed his kick at the far post when it seemed easier to score, but extra-time loomed large - a scenario not ideal for either team, especially on such an energy-sapping surface. 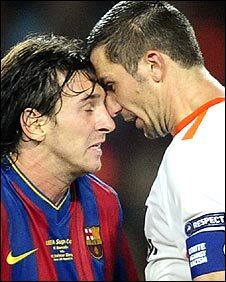 Shakhtar captain Darijo Srna was obviously not best pleased at the prospect as he appeared to headbutt Messi in injury time - though the Croatian avoided punishment as Messi was booked for his furious reaction. When the extra period started Shakhtar improved, substitute Aghahowa latching on to a clever pass and hammering in a shot that Victor Valdes parried away from danger. But Barca's class eventually told and after Messi twice went close from range he brilliantly teed up Pedro to slot past Andriy Pyatov. The Catalans' celebrations after the goal and on the final whistle left observers in no doubt whatsoever about how keen they were to get their hands on the trophy - the fifth Guardiola has won in only 14 months as a manager. Barcelona: Valdes, Dani Alves, Puyol, Pique, Abidal, Xavi, Toure Yaya (Busquets 100), Keita, Messi, Ibrahimovic (Pedro 81), Henry (Bojan 96). Subs Not Used: Pinto, Gudjohnsen, Maxwell, Muniesa. Shakhtar Donetsk: Pyatov, Srna, Kucher, Chigrinsky, Rat, Ilsinho, Gai (Kobin 78), Hubschman, Willian (Aghahowa 91), Fernandinho (Jadson 78), Luiz Adriano. Subs Not Used: Khudzamov, Gladkyy, Polyanskyi, Chyzhov. Booked: Ilsinho, Srna, Kucher, Kobin.